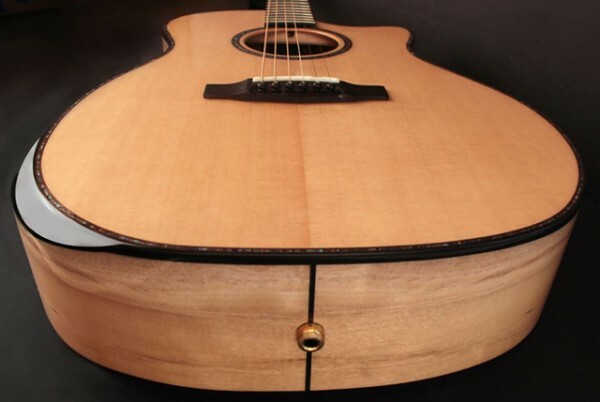 A comfortable “cut” on a guitar is no longer just about fret access. Cort proudly introduces the Bevel Cut Collection, a new series of acoustic guitars designed with an ergonomic beveled cutaway. This subtle, player-friendly feature provides a comfortable armrest for a more relaxed and rewarding playing experience that doesn’t interfere with the rich, sonic character of the guitar. Offering high-end features and unique tonal woods, each acoustic guitar in the Bevel Cut Collection has its own nuances for an unmatched blend of sound and feel. The four models in the Bevel Cut Collection share important design similarities, including a 25.3-inch scale and 1 11/16-inch (43 mm) nut width. The 20-fret mahogany neck, with dovetail neck joint, has an ovangkol fretboard. D’Addario EXP16 strings are fed through the ovangkol bridge. All four guitars have the popular solid Sitka spruce top, which offers an excellent balance between strength and flexibility and a sonic character that’s ideal for a variety of musical genres and playing styles. From these core similarities, Cort’s luthiers designed each model with unique sonic character and flair. The series offers two Grand Regal Bevel models, both with grand auditorium bodies but with different tonal woods. The GA-MY Bevel is built with myrtlewood arched back and sides. Myrtlewood’s sonic character is a marriage of rosewood, mahogany and maple that’s balanced and alive with bass, mid and treble and easy to bend. The Oregon Myrtle used on this model ranges in color from blonde-yellow to taupe and because no two sets look alike, each GA-MY Bevel is one-of-a-kind. 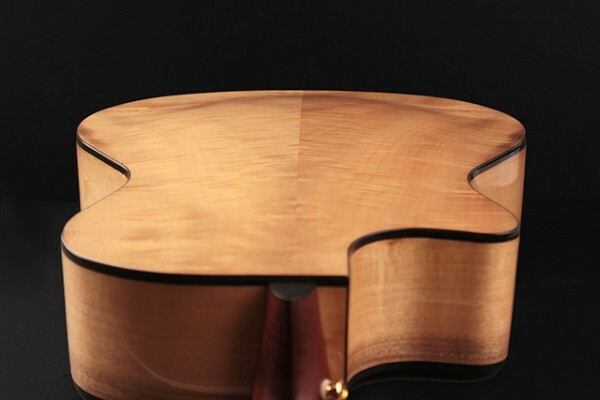 On the similarly constructed GA-PF Bevel, players will find an arched back and sides made of pau ferro, a tonal wood that exhibits characteristics of rosewood, ebony and maple, with powerful fundamental sound and subdued overtones. The arched back on both Grand Regal Bevel models is much more responsive and offers greater resonance and sustain. The sonically enhanced UV finish is strong and resistant to scratches, and its light weight improves the natural acoustic resonance of the body for a full and rich tone. The L.R. Baggs Preamp, a system that’s elegantly simple with only volume and tone controls, picks up the acoustic resonance and conveys it with full transparency to an amplifier or PA system. Esthetic similarities between the two Grand Regal Bevel models include diecast gold tuners with black knobs, ebony bridge pins, and an abalone rosette that corresponds to the top-rim binding. For players looking for a simpler design with similar ergonomic benefits, the dreadnought Earth Bevel and orchestra model Luce Bevel are solid choices. Both guitars are built with mahogany back and sides that are bright yet natural with a strong and warm midrange. Mahogany also enhances the body resonance and, in the absence of an onboard preamp, helps produce a greater volume. Esthetically, both the Earth Bevel and Luce Bevel offer diecast machine heads and a herringbone rosette for a natural, rustic appeal. The open pore finish not only enhances the resonance of the woods, but also reduces the weight of the guitar for improved playability. Combined with the bevel cutaway, both of these models offer a completely natural playing experience. Please see more information of four Bevel Cut Collection.